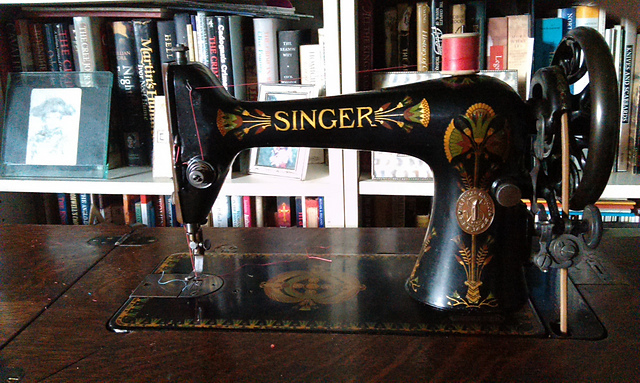 Our Suffragette era Singer 66K sewing machine. Knitting and sewing have always been feminist acts. Sometimes, it has been about activism as well. As a sort of historian, I’ve written on the blog, and will continue to write, about nineteenth century women who used crafts to escape the ‘cage’ of domesticity. It always fascinated me that needle arts were seen, culturally as the apogee of ‘femininity’ and yet were cleverly subverted by women and used to escape that same cage. I also write about and research women (and men) who used needlecrafts to express themselves, especially in that most hostile nineteenth century environment – the asylum. Even against all odds, people have used this ‘permitted’ form of expression, to revolutionise or provide commentary upon, their world. Clothing has also been used, historically, to express revolution. The colour of resistance has varied down the years. From sea-green, to white, to pink. And many other colours too. In the English Civil War, the Levellers often wore a sea-green ribbon on their arms, to identify themselves. In the eighteenth century, educated women signalled their intellectualism by wearing blue stockings. (There were male bluestockings as well). Suffragettes were identified with the colour white. White was chosen because it traditionally symbolised purity and ‘being good’ but also, women were refuting the suggestion that because they wanted equality, they were somehow ‘frumpy’. At the height of the suffragette movement, drapers’ shops were castigated for having white fabric in their window displays as a show of solidarity to their customers and they became identified with the movement. This suggests the link between crafts and activism is no new thing. Want to rebel? Make it yourself! Earlier nineteenth century American activist Sojourner Truth often chose to be photographed with her knitting. As a slave, she had knitted and spun tirelessly. In later life, free, she often taught knitting in order to empower former slaves with self sufficiency. She controlled her public image by choosing to wear elegant, well made clothing as well as holding her knitting in photos, to convey her respectability and middle class values. In the same way the later Suffragettes chose to turn up to marches and public events wearing white to exploit its beauty and perceived femininity. Pink pussyhats may be the new blue stockings. You’d have to have been under a stone not to notice the Pussyhat Project, recently. On one level, a sea of folk wearing pink hats has a dramatic, vivid impact. But appropriating a colour for a cause also implies solidarity and shared values. In a world where political correctness has been challenged, and for some it now seems ‘safe’ again to objectify women; where climate change is being denied, and nationalism and racism have reared their ugly heads, crafters have found a new way to express resistance. I’m also working on a Catwalk Pussyhat ebook .. [See below] with 4 Missoni-inspired pussyhats and a bunch of my ink and watercolor sketches of people wearing pussyhats. 😀 It won’t be free but it’s an adjunct to the Knitting as a Political Act ebook. I’m done with the pussyhats for now and will be starting up a spring project where I am making little snowflakes, flowers, and hearts to hang up on bulletin boards around town attached to little posters with science facts, climate change facts, and notes about diversity and immigration. Characterising women-the-Establishment-finds-threatening as “ugly”seems to come with the territory. In a week where objectifying successful women’s legs rather than their policies hit the headlines, I’d suggest the ‘ugliness’ lies elsewhere. I won’t link to the Daily Mail’s repellent ‘Legs It’ piece, because I’m not giving them even a single piece of traffic, if I can help it. But it seems to me little has changed in the past hundred years. And it’s easy to feel powerless in the face of such monumental levels of sexist crassness. Yet clothing, and the things we make with our hands, are not always superficial, and have a power in themselves. And that some clothing is handmade, in itself makes a statement. In a way, making things with your own hands is the ultimate uprising as we take our own fate literally in our hands and say to governments: “This is unacceptable”. In a world where it is easy to feel powerless, unrepresented and voiceless, a world made by others – making something yourself, to express your feelings is a taking back of power. Knitting As A Political Act, Donna Druchunas (free download). What’s New, Pussyhat? 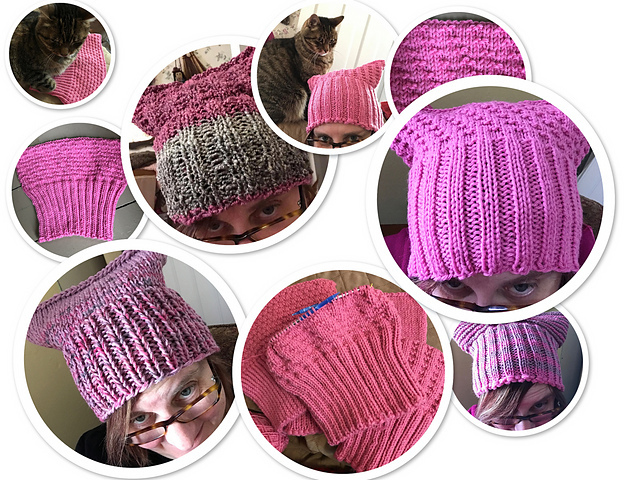 (Ravelry download, $4.99 or for free if you make a donation to Planned Parenthood and use the COUPON CODE Feminist when you check out). With many thanks to Donna Druchunas.